I feel compelled to at least post something about this day. I'd go read a bunch of links in blahpolar's link dump. Some really good stuff there including the questioning of whether there needs to be a "day" for everything? Also worth reading is this excellent article about Van Gogh and bipolar. March 30th is his birthday and thus the association. 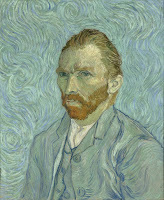 The article suggested that perhaps identifying with Van Gogh is not the best move. First off it's psychobiography and speculation about his illness(es). Maybe he just had epilepsy. It's also an untreated life that ended in suicide. Is this really the person we want to tout as a bipolar example? Sure he's a great figure, a great artist, yes, but why use his birthday? Finally, using him as an example perpetuates the intertwining of genius and madness. There's a romanticism to the tortured artist. Mania can produce some creative sparks but it can also destroy lives. And can't someone be stable and creative?